“English” actor Michael Cumpsty has only appeared once in a professional theater production in the country where he was born. The rest of his career in major movies, major TV series and major Broadway plays and musicals has been on this side of the Atlantic. The Tony-nominated actor currently is appearing at Red Bank’s Two River Theater in the six-character ensemble comedy “Absurd Person Singular” through Feb. 1. Try to catch it. It’s a great alternative to all the Super Bowl hype, especially come Sunday (Feb. 1, 2015) when the blitz begins in earnest at noon on NBC and continues until just before kick off when Broadway fave Idina Menzel sings the national anthem at 6:30 p.m.
At the “Absurd Person” performance I attended everyone around me was laughing often and loud during Alan Ayckbourn’s farcical 1972, three-act play about three married couples who meet over three successive Christmas Eves. As they rotate from house to house we see each of their fortunes change until one man, a newly minted capitalist, has them all dancing to his tune. There are plenty of slamming doors, physical comedy, and absurd situations. It is directed by Jessica Stone who has worked as an actress on and off-Broadway. Cumpsty, a veteran actor who also has directed, said that is his favorite combination in a director. Directors without acting experience can be impatient, lack skills or are stupid, or just childish. Born in Yorkshire, England, Cumpsty moved with his family to South Africa when he was 9 years old. He graduated high school when he was 16 during that country’s apartheid era when all white men were conscripted into the Army. He got a deferment to take his A levels (school leaving qualification exams) in England and was to return two years later to study medicine and become a doctor. Instead he applied for a Morehead Scholarship at the University of North Carolina (and modeled after the Rhodes Scholarship) and moved to Chapel Hill. Like many beginning American stage actors, Cumpsty thought he, too, should continue his studies in England where great actors are minted in droves. He had a friend who was a voice teacher with the Royal Shakespeare Company at its then London home at the Barbican Centre. “I was sitting in the Green Room chatting with these RSC actors and they all told me to go back to the United States. They all wanted to work here because of the fantastic opportunities, Cumpsty explained. The pay on Broadway is much better than it is at regional theaters across America. So why is this his fourth show (three as an actor, one as director) working at a regional theater an hour’s train ride south of NYC? 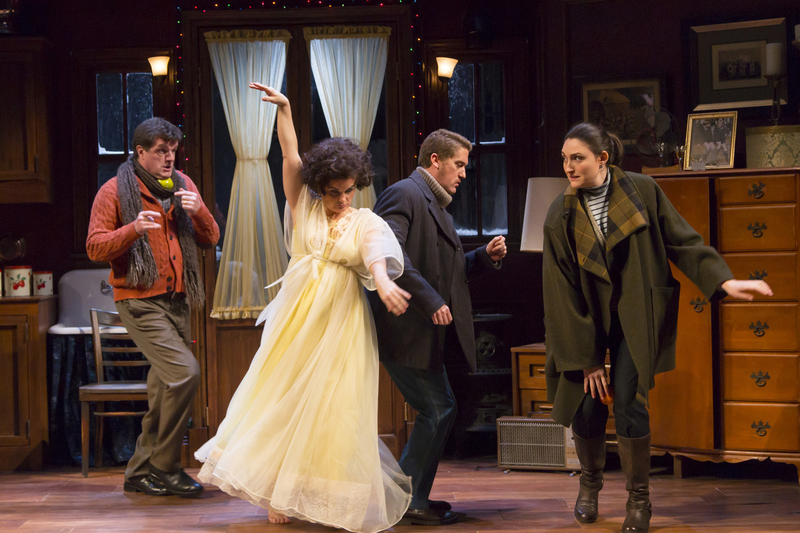 Cumpsty likens the venue to a “small, glittering bauble” among regional theaters. It’s close to the home he shares in Middletown, NJ, with Two River’s artistic director John Dias, his partner for about 20 years. They also have a place in NYC. Also, he said, in regional theaters the whole process from the first day of rehearsal to closing night, can be over in six or seven weeks. A commercial run is more complicated, he said, citing the 2012 Judy Garland play with music, “End of the Rainbow” (2012). “We had three or four weeks of rehearsals, played four weeks out of town and two weeks of previews in New York before opening night,” he explained. The show closed just under four months later. It did, however, result in a Tony nomination for Best Performance by an Actor in a Featured Role in a Play. He played Garland’s pianist who wants to save the singer from her complicated life. “I was incredibly fortunate for many years to work in New York theater for Joe Papp doing a lot of Shakespeare in the late ‘80s and ‘90s didn’t go out of town for years. I and find it so much more satisfying, especially rehearsing. In a TV show you may, literally, never rehearse. 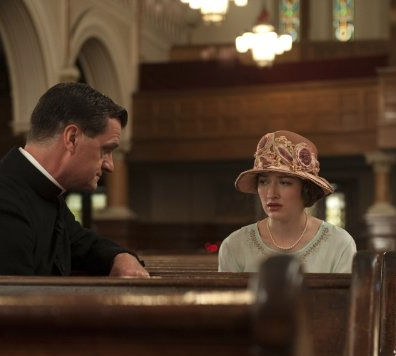 Still of Michael Cumpsty and Kelly Macdonald in Boardwalk Empire (2010). “I did a season on “LA Law.” after that I didn’t visit LA again to look for work. I am thrilled to do film and TV when I get it in New York because I really enjoy the process. “But it’s an entirely different (acting) process. You have no control over the editing. The final product seen by an audience is not controlled by you. Structurally speaking, the moments you see me performing are my responsibility, but cutting into pieces and splicing together are not. Others may make me look good, but it’s not my work. Although he says he is not a good singer, he enjoys musicals and his Broadway credits include playing John Dickinson in “1776” (1997), Julian Marsh in “42nd Street” (2001), Jules in “Sunday in the Park With George” in 2008. What he loves most, he says, is language oriented work. “Copenhagen,” the Michael Frayn play in which he played Werner Heisenberg on Broadway in 2000, was one of his most satisfying stage experiences. Having said that, he admits he loves a “slap-sticky farce” as well. Hence “Absurd Person Singular” which, in one scene, he is seen trying to hide in a cabinet that barely accommodates his head and shoulders. In the second act he stands on a table to to fix a ceiling light and ends up electrocuted and spends the rest of the scene in a red-faced grimace while shaking. Hamlet never had to deal with that problem. — Broadway plays: 17 of them, including “La Bête” (1991), “Timon of Athens” (1993), “The Heiress” (1995), and “The Constant Wife” (2005). — Shakespeare: Ttitle role and co-director of Classic Stage Company’s “Richard III” (2007). At the Public Theater he’s done the title role “Timon of Athens” (1996), Parolles in “All’s Well That Ends Well” (1993), Laertes in “Hamlet” (1990), Time/Lord in “The Winter’s Tale” (1989) and Escalus in ”Romeo and Juliet (1988). — Movies: “State of Grace” (1990), ”Fatal Instinct” (1993), “The Ice Storm” (1997), “Eat Pray Love” (2010) and “The Visitor” (2007).